OE-Mail Recovery (download) is the only solution you need if you cannot open Outlook Express or cannot see messages in Outlook Express. 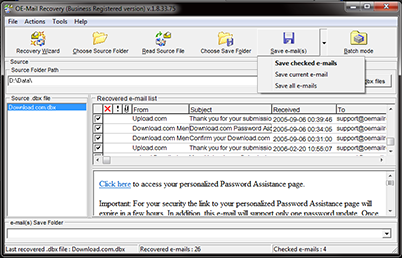 OE-Mail Recovery is an email recovery utility that was developed to recover accidentally deleted Outlook Express email messages (for recovering lost email data). 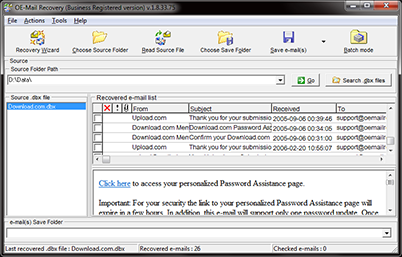 The tool recover lost email of Outlook Express. The damaged messages are recovered into the .eml format and this file in its turn can be imported into almost all email programs and Outlook Express as well. OE-Mail Recovery - Easy Outlook Repair is one of the best tools available for recovering lost email. You probably know how devastating a data loss disaster can be. You can't always tell what has gone wrong from the message, you simply cannot see message in Outlook Express or even cannot open Outlook Express. Internet email has grown to be one of the most widely used forms of communication in the world, and accidentally losing or deleting an important message can be one of the worst computer experiences you ever suffered from. Easy Outlook Repair - OE- Mail Recovery Software allows you to manage recovering of lost email data or deleted email messages quickly and easily. OE-Mail Recovery - Easy Outlook Repair is one of the best utilities available to fix the Outlook Express. OE-Mail Recovery software is an intelligent tool, implemented with professional interface and stable functionality to help you with recovering lost email from Outlook Express that are defective or damaged. The email recover tool lost emails Outlook Express easy. If you cannot see messages in Outlook Express or cannot open Outlook Express try a ridiculously easy Outlook Repair - OE-Mail Recovery software (email recover tool). Our software is the efficient and affordable alternative to costly and time-consuming recovering lost email and easy Outlook repair. OE-Mail Recovery allow recover lost email of Outlook Express. If you need recover Microsoft Outlook lost messages (Outlook lost email, email recover, repair OE6) (Microsoft Outlook is a part of Microsoft Office) then you should use Outlook repair tool. OE-Mail Recovery don't desined for a recovering Outlook lost email (email recover of Microsoft Outlook).